"Three Billionaire Misconceptions That Hold You Back"
Based on in-depth interviews with some of the world’s best entrepreneurs, this book teaches you how to think like a billionaire and achieve amazing success in business. Profit first-hand from the proven knowledge of self-made billionaires and step up your game. I come from an era when everyone wanted to know how to be a millionaire. 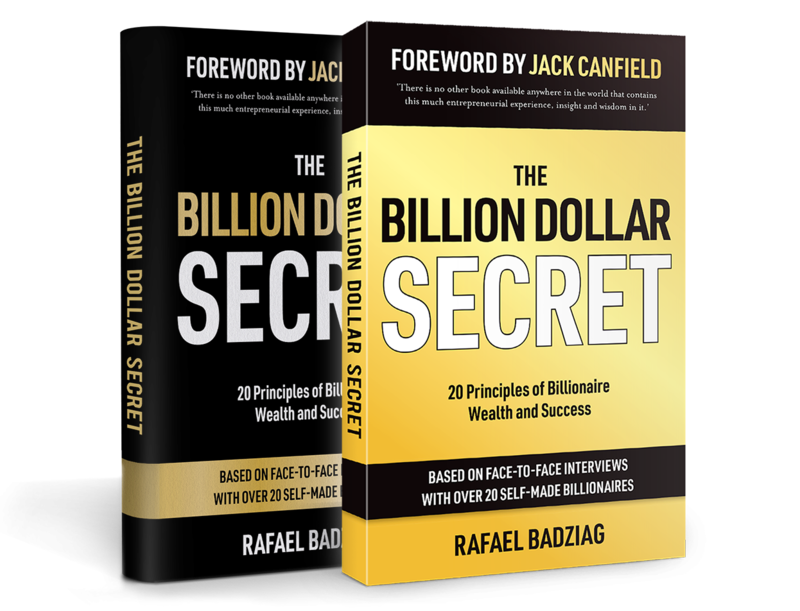 Rafael Badziag has compiled a new age book about what it is to be a billionaire in a world of digital and exponential growth. Over the decades I think the reader will find the foundations for being a leader are still the same, but with a twist. It is the twist that makes this book exceptional. I recommend this book because it contains all the essentials of how you can make your business a big success. This book would have been the right book for me when I was young. It would have saved me reading more than 20 biographies that I effectively bought and read at that time. I’ve always valued the real stories of successful people from their very own tone of voice. Therefore, I would like to thank the author of the book for giving me this opportunity to pass my message to the audience of ambitious people and share my real life experience with them. It would be my pleasure if my words could help them to achieve their goals in life. I recommend all entrepreneurs to have a look at this sensational book. I highly recommend this book. It is very thoroughly researched book on successful philosophies of life. Most successful people I know have an innate curiosity and desire to find out what paths others took that led to their success. This book answers that challenge for everyone as it spells out the characteristics and steps that enabled many successful entrepreneurs to reach their goals. A great road map that everyone can benefit from. I highly recommend this book. It gives real live stories of not only one but over 20 successful billionaire entrepreneurs. It’s not only a great pleasure to read this book, but I think it gives real exciting and valuable insights on how these entrepreneurs became so successful and how they built their fortune. And all of them did it from scratch. They did not inherit a family fortune. These are the real life stories of entrepreneurs who started with nothing and built a billion dollar fortune. I think it’s really useful, interesting and enjoyable to read.